Can you guess what I do with the 4 gallons of milk per day from our Jersey cow? I make cheese, butter, kefir, ice cream… I even share with friends, and clabber (spontaneously sour) some for the chickens. And then I figured out how to get both clabber for the chickens, and sour cream for us, with hardly any work at all! Check out the video and additional written instructions below to see how. For more information, check out our Cultured Dairy and Cheese eCourse. Start clabber milk right after milking — when the raw milk is still warm enough for culturing. Or, if you don't milk your own cow, simply let raw milk come to room temperature. Cover milk with a paper towel or cloth napkin and rubber band, then leave to spontaneously sour (or “clabber”) at room temperature for 1 to 2 days. Or longer, in the winter! Pasteurized milk won't spontaneously clabber because it lacks the naturally present organisms. You can, however, simulate clabber by adding a mesophilic cheese culture. After 1 to 2 (or longer) days, both the cream and milk are thickened from the acids produced by the proliferating natural organisms. The cream has also conveniently risen to the top. I skim off the cream — it's now sour cream — and chill. Then, I take the clabbered milk to the animals. And voila, done! With hardly any effort at all! To make sour cream without clabbering milk simultaneously, simply refrigerate milk until the cream has risen, skim off the cream, and let it sour at room temperature for 1 to 2 days as demonstrated above. Use sour cream as a topping for tacos, soup, salmon patties, and chili. It even makes the best cultured butter! Do you make sour cream? I tried this one time (saw it someplace else), and it all ended up tasting like stinky feet… I don’t have a cow, so I started with refrigerated raw milk from a local Grade A for raw dairy. Any ideas what went wrong? Alice — Clabber isn’t predictable. The best results come from totally fresh raw milk. Yours may not have been fresh and competing organisms affected the flavor. What else could I use the skimmed sour milk for? Being skimmed, I don’t think I’d want to use it for yogurt. What about as a substitute for buttermilk in recipes like pancakes? Julie — Baking is a great use for skimmed sour milk. Or anywhere you see yogurt or kefir called for. You can add it to smoothies or salad dressings, which would be good actually because you can add coconut oil or some fat to make up for it being skimmed. Sour milk is wonderful in pancakes and any baking that requires milk. I use my homemade kefir and also my sour milk in my baking. And to answer another question, yes, your pets will love it! Clabbered skim milk can be used to make low-fat cottage cheese, too. Cut the curd (optional), warm curd double boiler style, very slowly. In about an hour, the curds will firm up and there will be more whey. Strain through cheesecloth for about 2-3 hours. Break up curd, salt. Optionally, mix in a couple tablespoons of cream. Play around with options til you get it like you like it. Inspired by the Little House on the prairie cookbook. I discovered this the first time I tried clabbering whole milk. I had a half-gallon jar almost full, with a mason lid just resting on top (not screwed down). The cream made a thick plug (with lots of bubbles in it) and lifted the lid right off by about 2 inches! Elizabeth — That is SO funny! 🙂 What a surprise that must have been! How long is spontaneously soured cream generally good in your opinion? I have some cream that got a little lost in my fridge for a while:) It seems fine to me but then I am second guessing myself because I know it has been a loooong time! You mentioned filtering the milk when you bring it in. How do you do that? Kara — I put a gold coffee filter in a wide mouth funnel and set that on top of my jars. I pour the just-milked milk through that setup into the jars. Wardee filters the milk after milking to remove any debris that may have fallen in during the process. If you are getting your milk from a farmer or dairy this process will already have been done. I wish I could do that with goat’s milk but after that amount of time the milk is very goaty. I am really thinking about getting a cow next year. I will still keep my goats for my daughters 4H but I sure would like cow’s milk again. Thanks for sharing :). So we raise our own milking goats and I have tried doing the clabber thing and its not working is that because goats milk wont “clabber”? Can I still eat the sour cream on top?? Wardee, I have been working through your cultured dairy e-course for a while now and I had so much fun. But only just recently was I able to get raw milk. So my question, after the milk and/or cream is soured or clabbered, when does it really get bad, or is bad for you? Barbara — It doesn’t really get bad. It gets strong, and too strong for most people. At the top surface there may be mold growing. You can skim that away and usually underneath is fine. I’m just working through your eCourses at the moment, hope i’m not repeating something you already mentioned somewhere. Clabbered milk is used in Germany to make a traditional milk product called Quark. Thats how its traditionally done, without any added cultures: After skimming off the cream, just leave the fresh milk in a clean covered jar to ferment on the counter(1-3 days)( your clabbered milk), once it’s thick, pour it into a cheese cloth and hang it to drip dry over night in the fridge. Stir it well to make it smooth and silky, then fill it in clean jars. The aimed for consistency is thick, but not dry like cream cheese. It’s much milder than Kefir cheese and offers itself for many uses. We make Herb quark, mix in chopped fresh herbs with pepper and salt, serve it with cooked potatoes or rice- very tasty( or use dry herb salt)! Or we just spread it on our bread with honey, or served with mashed bananas and honey is very nice too as a desert for the kids. Or use it in a recipe for baked cheese cake. Thanks for sharing all your knowledge Wardee! Nina, I have a couple questions. You’ve skimmed the cream from a half gallon or so of fresh milk and let your skim milk sour on the counter? Do you have whey on the bottom and the “cheesy” material on top becomes quark? yeah i do the same as nina does and i make it into cheese.and i use it as cheese that i spread on toast or chappatis(whear flour breads) or i use it with herbs. Okay, I have some milk in my fridge that is just over a week old. It’s too sour to drink at this point (I tried) but I don’t want to waste it. Would this still work out okay if I skimmed the cream off…? I’m wanting probiotic sour cream to make ranch dip. Or, since it’s already souring some, would it not taste so good? I have not made my own sour cream before and I am not a huge fan of cultured dairy products as it is. But since my son and I have decided to start eating ranch dip with veggies I wanted to make my own so we could have good probiotics in it. Any thoughts on this? Worth a shot? Kate — Yes, you can. Just skim it off and that’s your sour cream. The only thing is whether you like the flavor or not. If you don’t, it still might work in dressing w/ the other ingredients to mask it. Or you might love it! As I mentioned in a previous comment, clabber is unpredictable and it is best when you start with fresh milk. BUT, I have often used sour cream from older milk and we like it. I am new to this working with raw milk. I let 3/4 a gallon sit on a open shelf for 1 week as my house is usually around 65 degrees. Only in the evenings do we reach 70 degrees. When I took my milk off the shelf, it had separated into milk on bottom, whey in the middle, cream on top. It did have alittle mold in one spot so I removed it before I worked with the milk. I removed the cream on top and put it in a dish. Then I ladled out as much as possible. (I had this in a gallon jar.) Then I ladled out the milk that was also thick, into a linen dish towel in a bowl. I let the cream and milk in separate bowl drain. That gave me additional whey. My question is what is the remainder milk/cream product called, and what can I do with it??? Hello. I am new to using raw milk. If I want to drink the skimmed milk should I let it sit in the fridge to seperate and then skim the top for sour cream or butter and then just keep the milk for drinking? Yes, you can do that. 🙂 In the video above, I let the milk and cream sour together, then skim off the cream. However, this means the milk is soured, too. If you want to keep the milk for drinking, you’d skim cream beforehand. I buy a gallon raw milk from a nutrition store. Once I get it home it only stays sweet for a few days before it starts to sour. There are times that I haven’t had chance to finish it and (because I heard raw milk never goes bad) it has sat in the fridge for many, many weeks in a glass ball jar. It smells and tastes so sour that I’m sort of afraid to use it. Is it really ok? Does it matter if the milk has soured naturally on the counter or soured in the fridge? When is it TOO bad to consume? How long will the clabbered milk last in the fridge and do you need to warm the milk if it has been in the fridge before culturing? I’ve kept clabbered milk for a quite a while in the fridge– maybe a week or a little more. It’s a great way to extend the life of the milk. I don’t warm my milk, I remove it from the fridge and set it to clabber. Super easy! I’ve tried culturing our raw milk but it always separates and smells terrible! Ive tried kefir and yogurt, but I think our house gets too warm (up to 85 when the stove is on). I’ll try sour cream though, I just hate wasting milk. I love making sour cream by using 3 parts cream mixed with 1 part cultured buttermilk to get it going: leave overnight to culture and you have sour cream on top and buttermilk you can use again for a start, on the bottom. I love this easy method Wardeh shared, too, but the flavor is amazing and consistent with a buttermilk start. We LOVE making glaze using this sour cream and brown sugar: aMAZing on cinnamon rolls or as a fruit dip. I’ve seen several people mention their raw milk only lasts a few days. This I don’t understand. I have a herdshare in a local Jersey dairy. I pick up my gallon once a week, but if I go away on vacation for 10 days, the milk is still fresh for another 2 or 3 days, and it is sweet. I do keep my milk on the bottom shelf of a refrigerator in our garage that is only opened once a day or so, so the temp remains constant, but I’ve drunk 14-day-old milk and found it still sweet. The dairy has a good refrigeration tank, which may be the secret. My raw soured cream tastes nasty. If I would use sour cream as a starter, would that make the soured cream taste better? The buttermilk sitting under the sour cream will be thick like yogurt, but is delicious and can be re-used for your next batch of sour cream. We buy raw milk from the Amish and its already chilled. Can you still do this? Now if I only had a cow…or at least access to raw milk. What little sour cream that I use, I will just by at the food stores. Minnesota bans regular people– who don’t own cows– from buying raw milk from dairy farmers 🙁 … so stupid…we grew up on “raw milk” when my uncle was a dairy farmer. I will have to try this with my goats milk and see if it works. If it doesn’t chickens just get more yummy food!!! Will gently pasteurized but not homogenized milk work? Do you milk by hand or use a milking machine? Is it at all possible to make sour cream from pasteurised milk? We have no access to raw milk at the moment, only shop bought pasteurised. Hi. 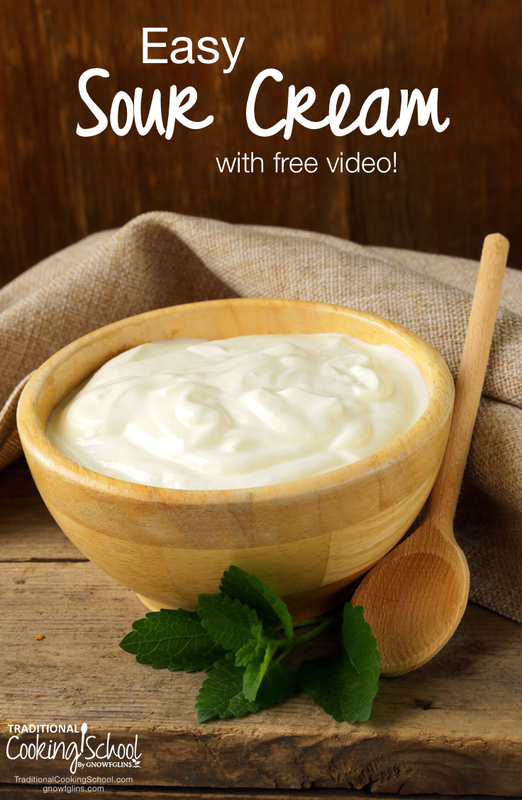 I was hoping you might be able to send me links to your dairy video’s/blogs/articles? I am getting two dairy-goats in a couple of weeks, and while i make my own yogurt and soft cheeses, I realyl want to learn all the different things I can do with milk so as not to waste it. I have made butter before, and it was good, but I know I can do better with practice. I know that often-times ‘cultured’ milk is used for making butter, how do I do this? do I let it sour first? I know that to get any decent amount of cream out of goat-milk I have to get a seperator. I am just bubbling over with questions.